EASTER WOODCUTTERS MOUNTAIN BIKE EXPERIENCE . Join Jacques for a morning of MTB fun and exploring our cool leafy forest and mountain vistas . Our yearly Easter outride . Bring your own bike or hire one from us . 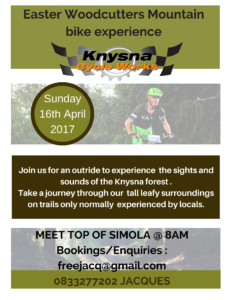 The ride will start at the Top of Simola and take you along trails and single track.